This next recipe was something I decided to make this morning when I was looking through my housemates Jamie Oliver cookbook for inspiration for this weeks food and there was a recipe for fish and chips. I never follow recipes, unless I'm baking so I was simply looking to decide what kind of flavours and things I wanted to create. 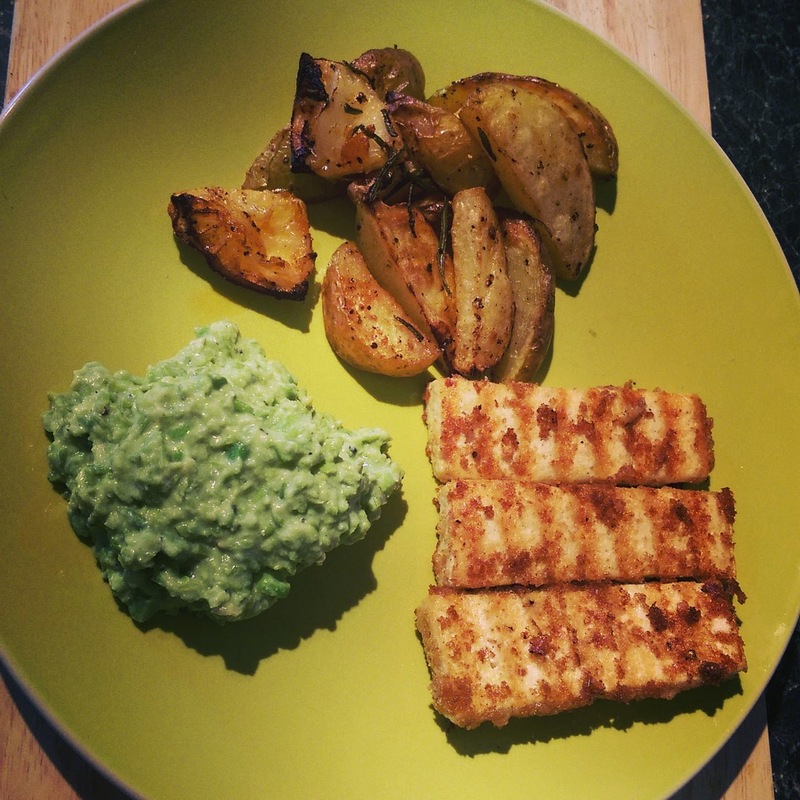 This is sea salt & apple cyder vinegar tofu, with lemon rosemary chips and mushy peas - vegan fish and chips if you will, and all I'll say is that you have to try this! I've also ordered an organic veg box from Abel and Cole, because as I mentioned in my last post, Asda is just not up to scratch! They offer local, seasonal organic fruit and veg as well as soy milk, yogurt, veggie sausages and burgers etc, rice, pasta, grains, beans, meats, dairy and anything you could possibly want in a food shop. I'm especially looking forward to the seasonal squash, as well as rainbow chard and purple carrots! It may be more expensive buying it like this, but I want to try eating as much organic food as I can, as I feel like eating healthy but still putting harmful chemicals in your body is a complete contradiction and its something I'm working on changing. And whilst my order is not coming until Thursday, so I cannot comment on the quality of the produce yet, by entering the code 'EATVEG' at the checkout (as mentioned on their website) you can receive their cookbook worth £12.99 for free as well as your 4th order free! Place the tofu in a pan and pour over the cyder vinegar, sprinkle with a fair amount of salt and then leave to marinate for at least 30 minutes, but it can be left for a few hours or over night if more convenient. Pre heat the oven to 200C. Add the potatoes to the roasting pan along with the garlic cloves & rosemary, drizzle with olive oil and a bit of lemon juice, then add the lemon wedges to the pan. Sprinkle over a pinch of salt, pepper and paprika and bake for 35-40 minutes, turning them half way to ensure they're crisp all over! Drizzle a small amount of oil into the griddle pan, then take a slice of tofu at a time and coat it in breadcrumbs, before adding it to the hot pan, do this with all the tofu turning after a few minutes when it turns crisp and golden brown. Meanwhile, add the peas, lemon juice, olive oil, soy yogurt and a pinch of salt & pepper to the food processor (I used my nutribullet) and pulse until it reaches your desired consistency, alternatively, you can mash by hand. Then take the roasted garlic from the potatoes, peel & crush it and add to the small saucepan along with your mushy peas and warm through.